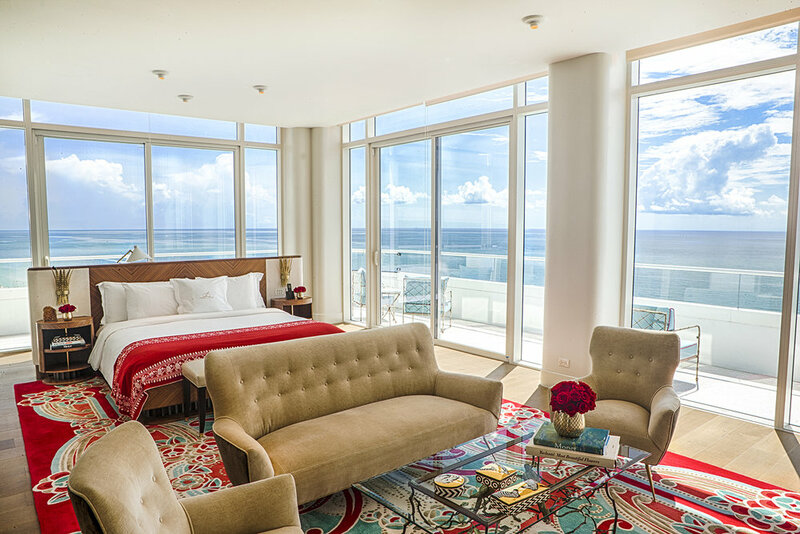 September 14, 2018 / Valerie Wilson Travel, Inc.
Perched atop the one-of-a-kind Faena Hotel Miami Beach with jaw-dropping views of the Atlantic Ocean and Miami skyline, the two-story Duplex Penthouse offers 14,000 square feet of sublime indoor/outdoor living. Boasting five bedrooms, six bathrooms, a chef’s kitchen, dining room, floor-to-ceiling windows, wraparound oceanfront balconies and more, this stunning residential-style suite features incredible Art Deco design conceived by Alan Faena and brought to life by Academy Award nominated director Baz Luhrmann and Academy Award winning costume and production designer Catherine Martin. Faena’s Duplex Penthouse is elegantly outfitted with handcrafted furnishings by Cote France, as well as museum-quality custom wood furniture from Frank Pollaro, famous for his collaborations with actor Brad Pitt. In addition to dedicated Faena Butler service and a hidden in-suite elevator entrance, guests of the Duplex Penthouse can also enjoy private dinners crafted by Faena’s executive chefs in the suite’s spacious dining rooms, sun bathe in luxury along the secluded oceanfront terrace, indulge in daily wine and cheese service, and simply unwind with a Faena rose oil & petal bath prepared by our butlers. What sets you apart from other suites in this city? We don’t mean to brag, but our opulent Penthouse is the largest in the entire country, boasting over 14,000 square feet of sublime living space. And that’s just one of my stand-out features. I have dedicated Faena Butler service, spectacular views of Miami Beach, Atlantic Ocean & downtown/Brickell city skylines with glass-to-ceiling windows, over-the-top welcome amenities (think edible creations of Damien Hirst’s mammoth), incredible Art Deco furnishings & fine artwork along the walls, state-of- the-art chef’s kitchen, and a grand piano tucked away near the oceanfront wraparound terrace. There are his and her showers in my Carrera marble master bathroom with a Toto toilet, a lavish, over-the-top soaking tub made in Florence, and a full line of Tierra Santa Healing House beauty products. How would you like to be remembered? Faena is more than just a hotel, or a District – it’s a movement. I hope that people far and wide will remember Faena as a cultural epicenter in Miami Beach, a platform for creatives and innovative thinking where art, entertainment, luxury, lifestyle, culture and community come together to elevate lives. Click here to learn more about Faena Hotel Miami Beach and the Valerie Wilson Travel Suite Access™ benefits available to you.